The earliest Django was likely to have met Beryl Davis b.1924 was in 1938 when she was more probably 14. She definitely performed duly chaperoned with them in Paris in 1938. On at least one occasion, she was booed for singing in English. 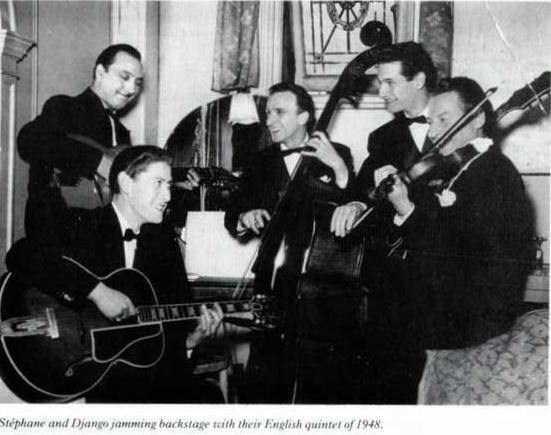 The Scandanavian tour (see photo of them together backstage) was in February 1939 and Beryl performed with the Quintette a lot that year aged 15. The Quintette of Hot Club of France (QHCF) visited Sweden and performed in Stockholm during February 1939. The concert by QHCF featuring Django Reinhardt and Stephane Grappelli as the main attractions was attended by an enthusiastic audience. Beryl Davis was featured as vocalist on the tour.. The Concert Hall in Stockholm shelters the finest premises in Sweden for musical entertainment. A magnificent specimen of modern Swedish architecture. The blue Concert Hall at Hötorget (the Haymarket) in central Stockholm is one of Sweden’s great architectural masterpieces. 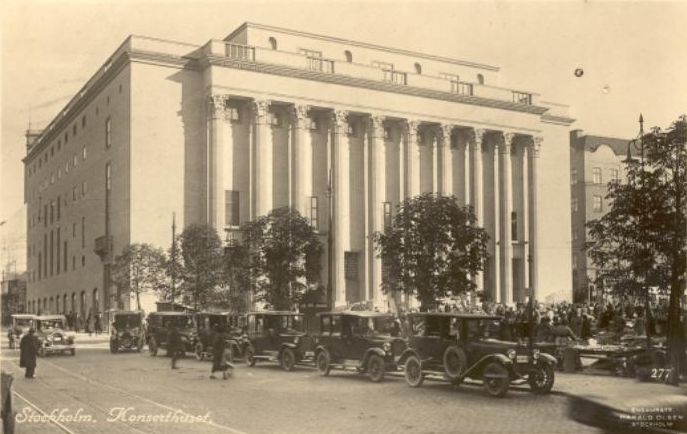 Opened in 1926, it was designed by architect Ivar Tengbom during a period of expansion in the capital. 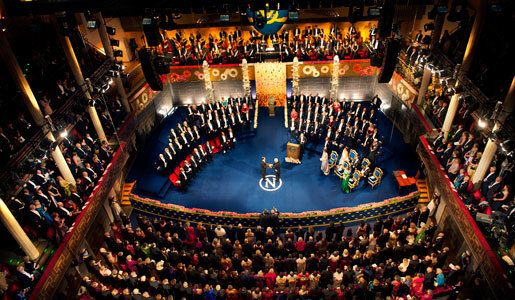 The Concert Hall was built to house what is now the Royal Stockholm Philharmonic Orchestra and to serve as an arena for the Nobel Prize Ceremony and other such formal occasions. This avantgarde-composition with its “modern” augmented harmony in the opening was composed under Quintette du Hot Club de France‘s Scandinavian-tour in 1939. It is more a concert-piece then a swing tune and Django recorded it 3 times in different arrangements. First with the string-quintet on March 21, 1939, and later with the big orchestra Django’s Music on Dec. 26, 1940 and finally with the Nouveau Quintette on Sept. 7-19, 1947. In 1948 Mitchell was called on to play with Stephane Grappelli and Django Reinhardt for an 8-week tour of Sweden. All other references to this tour indicate the group was Malcolm Mitchell, Alan Mindel (gtrs) and Teddy Wadmore (bass). In fact, Mitchell wrote an article confirming that particular combination for Scandinavia. Svenska Hotkvintetten (The Swedish Hot Quintette) was formed 1939, initially modelled after The Quintette of Hot Club of France (QHCF) that had visited Sweden and performed in Stockholm during February that year. 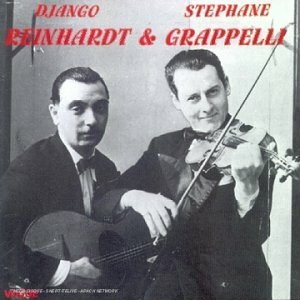 The concert by QHCF featuring Django Reinhardt and Stephane Grappelli as the main attractions was attended by an enthusiastic audience, among the crowd also some young Swedish musicians, who were thrilled by the string wizardry of Django & co.. Shortly after this concert the guitarist Sven Stiberg (1914-1992) took the initiative in founding the Swedish Hot Quintet, the members carefully handpicked from several orchestras. 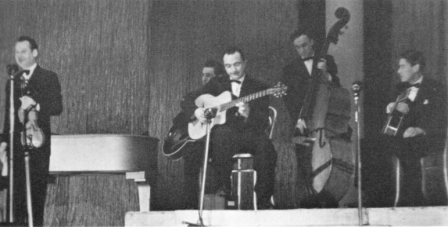 Emil Iwring on violin, Folke Eriksberg and Kalle Löhr on rhythm guitar, Roland Bengsson on double bass. As the members already were engaged in other jobs, the quintet mainly became a studio recording ensemble during its shortlived time from 1939-41 and frequently had changing members in the rhythm section. The quintet recorded about 40 sides for Columbia during this period, 27 of these are re-issued on the cd shown above (Dragon, DRCD 223) documenting the legacy of a great string swing ensemble mostly unknown outside Scandinavia. Although the Svenska Hotkvintetten was modelled after the QHCF, the group had a distinctive voice of its own thanks to the arrangements and amazing solo fretwork by Sven Stiberg, who was completely self-taught and the pioneer single-string guitar soloist in Swedish jazz. Later he was the first to play electric guitar as a mainstay with Thore Ehrling’s Orchestra (1943-49). The CD is a great tribute to the formative period of a great guitarist, who ranked among the greatest swing guitarists ever. Sven Stiberg Lead Guitar – Emil Iwring on violin, Folke Eriksberg and Kalle Löhr on rhythm guitar, Roland Bengsson or Per Liljfors on double bass. Born in Stockholm. Self-taught, began playing the mandolin and banjo. Became a professional musician 1937. In the late 1930s he played with such Seymour Östervallskog and Lulle Ellboj . He came to be known as the first Swedish guitarist when he played with Thore Ehrling Orchestra 1940-49 and appeared as soloist. Then started his own orchestra and was a member of the radio’s entertainment orchestra until it was disbanded 1963 Then he went on to become a producer on the radio melody. .Played with Toots Thielemans Trio and the ” Charlie & Cie “. Became one of the founders of the Swedish Hotkvintetten . Born Eriksson at the south of Stockholm. 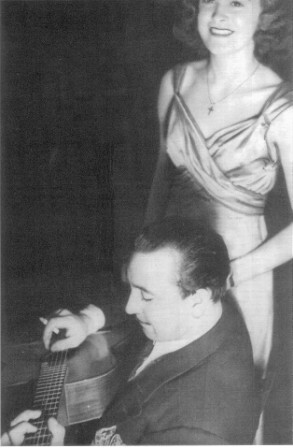 Musician (violin) and orchestra leader. Musician (bass), orchestra leader and studio musician. Was originally a trumpeter and a violinist, but learned to play bass for Henry “Basludde” Lundin. . Played in Arne Hülphers and Thore Ehrling bands before he started his own band 1946 From the late 1960s he was a music producer on Swedish radio also used the pseudonyms Clambake Seven, Johnny Farmer and Johnny Kjell. The top jazz activities were concentrated to Stockholm, and the number one jazz club was Nalen. In fact a dance saloon but with three stages, from where jazz was playing every night by the Swedish top musicians plus American guests such as Charlie Parker, Sonny Rollins, Stan Getz and many others. Jens ”Jesse” Lindgren – Hot trombonist, sweet vocalist, who never wants to ”grow up” from the Jazz Age. Mostly the M.C. of the band.Jens ”Jesse” Lindgren was born on the 19 of July in 1945 in Stockholm. Started playing the banjo in a band called Jazzgossarna (1961) and the trombone in the Eagle Band (1962). Started playing in Kustbandet in 1964.Favourits: 1920- and 30´s style-forming trombonists as: J.C. Higginbotham, Dicky Wells, Miff Mole, Tricky Sam Nanton, Jimmy Harrison och New Orleans-players as Kid Ory and Jim Robinson. Has played in/plays with Maggie’s Blue Five, Jesse’s New Orleans Band, Classic Jazz Band plus combinations with Bent Persson, Eddie Bruhner and many more Stockholm band leaders. Has produced a couple of hundred jazz programs for the Swedish Radio, a. o. Jesses Jazzbar (1982-90). From 1980 Head of the Swedish Jazz Archives. Since 1987 a member of the Swedish Jazz Academy and has a lot of other cultural connections. Asked for as M.C. on different occasions. – I have owned the guitar for 15 yrs. What renewed my interest that it may be a “Django” guitar is when I discovered that Birger Steiner was also the name of his music store and lo it arrived there 2 weeks before Django hit Stockholm in 1939! The guitar is the real deal…some poorly repaired top cracks with old refinish, no zero fret, changed tuner buttons…has 5 top braces, not 4. Still plays…you get goosebumps when you hear it. The case is absolutely authentic and old. When I have a little spare time I will shoot some photos of both and send them to you. – Thanks for all your help in search of the Holy Grail. Stu. (Labels from Norrkoping, Ostersund, Jonkoping, Hamburg, Milan, Lugano) Birger Steiner-a music shop in Stockholm, Sweden.